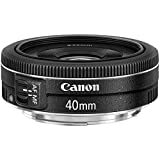 Amazon has the canon EF 40mm f/2.8 stm lens - fixed for $179 with free shipping. Sells for $179+ Highest Price. Deals for $145 Lowest Price. Normally $155+.